I’ve been working in the business analysis profession for (gulp!) over 18 years. Like many of my peers, I fell into in the role, having started as a programmer first. There was very little formal training in my early career. Many of the techniques I use have been picked up “on the job” – I generally take a “pick ‘n’ mix” approach, matching the technique to the business need. Although I haven’t used the Volere Requirements Process end-to-end “in anger”, in my humble opinion it is the most complete end-to-end methodology for elicitation, documentation, analysis, and communication of requirements. What Volere provides you is the means to deliver consistent, unambiguous requirements that are traceable, testable and complete. However, calling it a methodology is a bit of a misnomer. One doesn’t have to follow the process pedantically – the various components can be used individually, or collectively, and/or in conjunction with other techniques, depending on what is required for that project. The components provide you with a great set of tools to ensure you’ve covered all your bases. In my previous consulting role. where I worked for various clients, and in my current role, that really suits my style. For example, I have used the Specification Template as a sort of “checklist” to develop a product description document (for which we didn’t have a ready-made template). I often use scenarios to validate my business use cases. And I firmly believe that business context diagrams are a must for understanding and communicating the impact of change – to a system / process / whatever – on the organisation. The structure of the Volere process has also been a godsend in terms of coaching BAs. Juniors I’ve worked with agreed that the role and tasks of business analysis made so much more sense after attending the Mastering the Requirements Process course. And intermediates and seniors that have attended have returned to the office enthused and inspired by Suzanne and James’ approach. I look forward to further developments in Volere and hope to contribute where possible in the future. 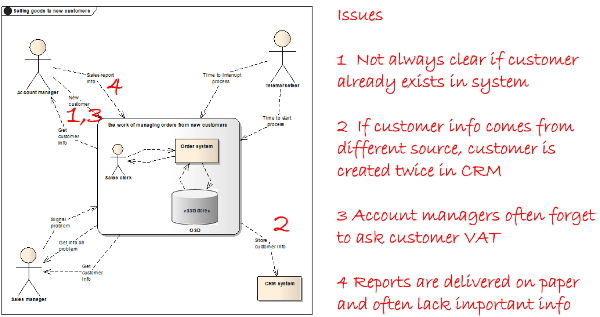 It helps to “go back” to the business requirements in cases where the user directly proposes the solution.